Check out all the pics from the event and even a drone video below. Thanks to ET SURF, RIDER SHACK, ZJ BOARDING HOUSE and WATERMANS for helping put on a great event. Drone clips of the event. We happened into some nice waves at 26th Street in Manhattan for the event. We brought down close to 40 boards to demo and at one point every single one was in the water. Needless to say there were a few collisions. This kid was so stoked to join the crowd on a Kolohe Andino “Exacta” board that he forgot to put his leash on. It’s the same exact dimension that KA rides. Theo Lewitt and Josh Stone showed up. Every grom should own a copy of “Here Today… Gone To Cabo” to see how the pros do a surfing road trip. Mini-grom taking out the 5’4″ RV. Andre with the Mason Ho “Exacta” board. The one board we shouldn’t put a tail pad on. Hmmm… what fins should I use? Taj showed up and blasted a few backside airs. In case you wanted to feel what it’s like to be Griffin Colapinto. Even a drone came out to see all the action. The smallest boards we brought – a 4’7″. Yes, that’s cork. Just like a wine bottle. Groms attacking the ball board toss. And winning …Lost clothing prizes along the way. Matt “Mayhem” Biolos talking tech. South Bay shredder Matt Pagan. The free burritos got gobbled. Wardo missed the demo but showed up just in time for beers at Watermans Hermosa Beach with his wife Michele. …Lost pictorial table at Watermans. Ward forgot to bring his board for Watermans to hang on their wall but luckily Amber drove all the way from SC to deliver it for him. We raffled off a ton of …Lost goodies at Watermans including tees and these nifty bottle openers. They have magnets to attach to your fridge. You know Ward wanted one too. Chris signing a copy of “Here Today… Gone To Cabo”. Joe Alani and Chris Ward. Big Paul with a big beer. 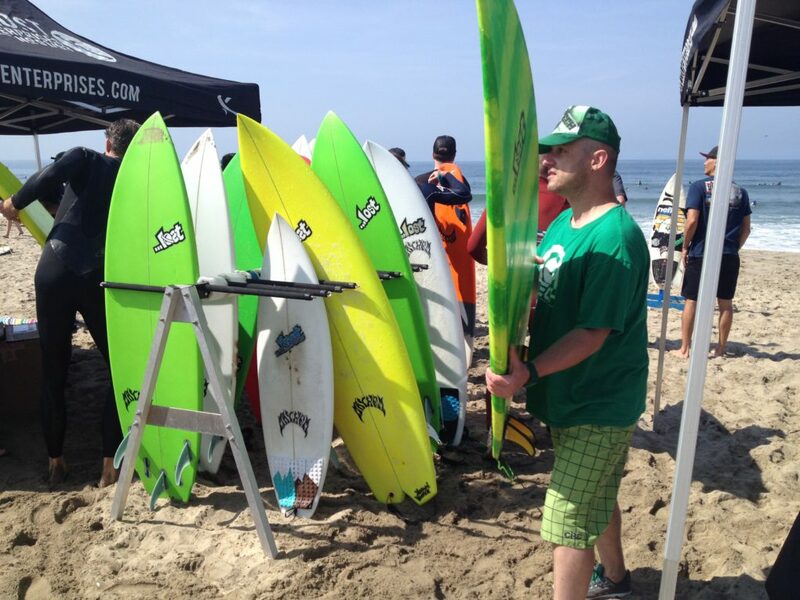 This lucky guy won a Kolohe trade in. And this even luckier guy one a new V2 Shortboard. And another happy camper with his new …Lost SurfSkate. Come down to 26th Street in Manhattan Beach CA on Saturday March 29th from 8AM – 2PM and demo all the latest …Lost surfboard models. Hang with Matt “Mayhem” Biolos and pick his brain on surfboard design, tech and function. If we dangle a carrot big enough Chris Ward could possibly show up too. There’s also going to be …Lost clothing giveaways and free burritos. After party at Watermans in Hermosa Beach.